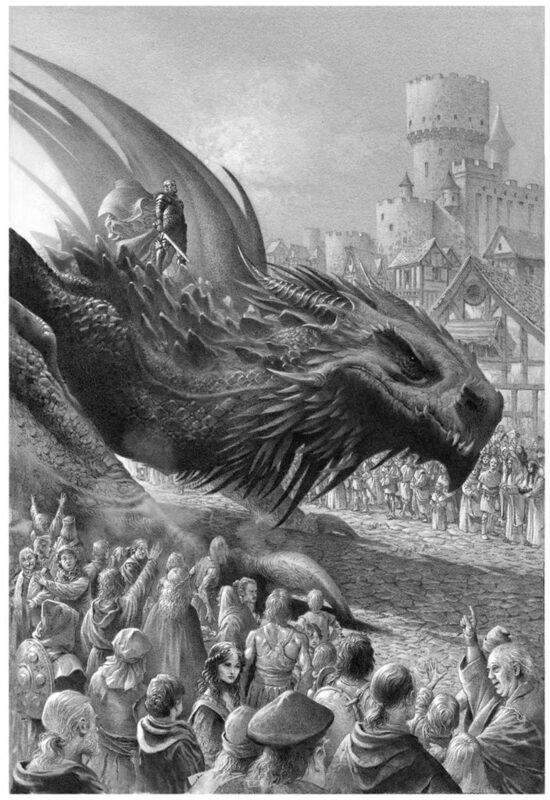 The excerpt gives us a peak into the early days of Aegon Targaryen reign over Westeros. It details the construction of King’s Landing, Aegon’s difficulty maintaining a Hand, the creation of the position of Grand Maester and the formation of the Kingsguard … which was Visenya Targaryen’s idea, as it turns out. Yes, we also get some fascinating insight into Aegon’s sister-wives, Rhaenys and Visenya, who had a bit of a Sansa/Arya dynamic. Rhaenys had a great love for music (an effective political tool) and affection for the smallfolk. She also established laws limiting the number of times a husband could beat his wife (… yay?). Visenya twice wielded Dark Sister in Aegon’s defense when he was set upon by Dornish cutthroats. Suspicious and ferocious by turns, she trusted no one but her brother. During the Dornish War, she took to wearing a shirt of mail night and day, even under her court clothes, and urged the king to do the same. When Aegon refused, Visenya grew furious. When the king pointed out that he had guardsmen around him, Visenya drew Dark Sister and slashed him across the cheek so quickly the guards had no time to react. “Your guards are slow and lazy,” she said. “I could have killed you as easily as I cut you. You require better protection.” King Aegon, bleeding, had no choice but to agree. You can read the entire excerpt at The Hollywood Reporter. Fire & Blood hits shelves on November 20. Sorry to be Debbie Downer but I know of one person who isn’t anticipating it hotly. Visenya seems to have been reincarnated and came back as Arya “You need better guards” Stark. Can’t wait to get it and see how it expands AWOIAF. Also, I believe Visenya being the one to initiate the Kingsguard was mentioned in AWOIAF after she saved Aegon. So Dany dies and Jon marries his sisters(now cousins) echoing Aegon/Visenya/Rhaenys era?! LOL..just kidding 🙂 But wouldn’t that be a ‘twist’! I’m pretty sure I’ve read this stuff a few years ago. There is a book that’s hotly anticipated from George R.R. Martin’s and this sure ain’t it. This is something I may actually consider reading. I never bought AWOIAF due to Elio & Linda involvement (as you know, I utterly despise those two) but this seems more GRRM-ish work so I may actually consider reading it. Although I can say I indeed find it frustrating that GRRM seems to be focused on everything else more than on WoW. Obviously, he must be stuck with the story there. One does not ‘peak’ at something. They ‘peek’ at it. Those illustrations look just amazing! Looking forward to my copy arriving. Yes, yes – I swore I’d never buy it – but then some of the illustrations were published on this and other sites. Has the artist done a GoT calendar yet? 1. It’s half-price if you pre-order. 2. I’ve got a book token to use up. Love, love the name and of course the music. I wish I had thought of using it! You know, in even GOT scripts I have seen has some bizarre use of words. We need to get Stannis to get things straightened. George did say he wrote a TON of Targaryen material that was unused so why not make a book out of it I guess? I have to admit I really enjoyed Elio & Linda’s reviews in the early days. They did a great job at breaking down episodes intertwined with relevant ASOIAF information, but then the childish antics started when the show deviated from whatever vision they had/have for the series… Sad really, I mean it’s common knowledge D&D did all that’s possible to transfer Georges vision to the screen. Why get all bent out of shape over it? What the hell else were they going to do? We wouldn’t have any GoT’s without them! I think it’s pretty simple why TWOW is proving to be a nightmare for GRRM. He’s wrote himself into a corner with ADWD, too many unnecessary loose ends to tie together, not saying he can’t do it but he is a perfectionist and always refers to the series as his Magnum Opus. That’s alot of pressure on yourself with the added steam train of hordes of book and show fans alike expecting a masterpiece. I’m sure someone will eventually get on it, but GRRM did an interview where he said he was locked away in a mountain hideout working on finishing Winds. The last time he said he was “locked away in a bunker” finishing a book, Dance was released within a year… I can definitely see GRRM dropping a “throwback” line like that as a code or hint. Quite interesting interview & information. He also said something along the lines of not changing anything to match the show. That he’s had his planned ending for 25 years and he’s sticking with it. Now was the abandoning of the time jump before or after he came to this ending 25 years ago? Because he had Jon/AryaI in love with each other. Does he stick with that, shift it to Sansa because of the lack of time jump, or to Dany like in the show? I’m getting the feeling Winds is gonna be a great read despite the show coming to a conclusion and GRRM will have plenty of story still to tell that the show has cut or altered. And I’m still firmly on the Winds will be released not long after the Thrones finale airs train. In the same post he admits to jumping the gun about the title of Jane Goldman’s prequel which is still Untitled, according to HBO 😂I am also optimistic about the release of TWoW. In the same post he admits to jumping the gun about the title of Jane Goldman’s prequel which is still Untitled, according to HBO I am also optimistic about the release of TWoW. Reviewed in The Times this morning as a “self-indulgent crap”. And that’s by a self-proclaimed fan of the books and programme too. Ouch. GRRM can do what he likes of course, but I do wonder why he’s wasting his time with this stuff when he hasn’t finished his magnum opus yet. I think that’s a very unfair review and description of this book. That reviewer appears to be ignorant on the genesis of the book. To call it “self-indulgent” is unjustified because it’s just not true. His editors asked him to write sidebars for a graphic coffee table book that they wanted to publish. He asked if they wanted that with Winds not complete. They said yes, that’s fine, do it anyway. This then became The World of Ice and Fire. This new book is material that was too much to publish in that book, and is in an expanded version of what he wrote for House Targaryen. As mentioned, the vast majority of the material in this book was already written by Martin 3 or 4 years ago for The World of Ice and Fire. It is a false narrative that George decided to write this book because he was excited to do so and bored with writing Winds. My guess is this is the thought process of that reviewer which lead to the “self-indulgent” description. And it’s just false. Weren’t they great? I think the Subterranean Press edition is an illustration of Daenys the Dreamer. Three to four years ago is still post-Dance and pre-Winds. And do you honestly think his publisher would rather have this than Winds? Anyway, the emphasis of the review is that it’s an incredibly dry read – with one of its biggest failings being that it is all told in the voice of this archmaester – and there’s no compelling narrative throughout. I do get that some people will enjoy this stuff for background. But GRRM is a damned great storyteller. Why not finish telling the story before moving onto this stuff? Again, up to him, I just don’t understand it. Yes, thank you, Dark Sister. I liked the German edition cover the best, then the US edition. I’m not so thrilled about this book that I’ll be buying the bulky hardcover edition – I prefer paperbacks – but I might buy the ebook edition or just wait for the mass market paperback. TWOW, on the other hand, I will probably by in the hardcover! I asked on an earlier article but was a little late in contributing towards that one. Anyway I am thinking to purchase either this or the World of Ice and Fire for Christmas. I have read all ASOIF books but nothing else, would anyone recommend which is the best to buy and read before S8 airs? Just looking to lose myself in the world a little. Great post and I agree with all of it. One minor point and this is more due to my lack of knowledge but is Elio as critical of GOT as Linda is? I wrote on a prior article how she dropped spoilers from S5 E10 all over twitter before it aired and how she makes videos trolling the show under the banner of a review however I’ve not seen or heard Elio pass comment and had understood he doesn’t watch because he wants to avoid future book spoilers. Despite the criticisms of Elio and Linda, I personally enjoyed TWoIaF. It has beautiful illustrations and also really great background info on things that have and have not been mentioned on the show. Sort of like the Histories and Lore special features from GoT. I like that it’s also written from the perspective of a maester so some of what is written could be contested. I would also like to explore the world a little more so I’ll definitely get Fire & Blood but was also thinking about beginning the Dunk & Egg series.